A popular dish in the Middle East, and a favorite among vegetarians, falafels are deep-fried balls or patties that are made from chickpeas or fava beans and spices. That's where this homemade falafel hot sauce comes in. This hot sauce can be drizzled into a falafel pita sandwich or used for dipping. Plus, the hot sauce is great at room temperature and even cold! Bring to a boil, then reduce heat to low and allow to simmer for 15 to 20 minutes. Stir frequently. 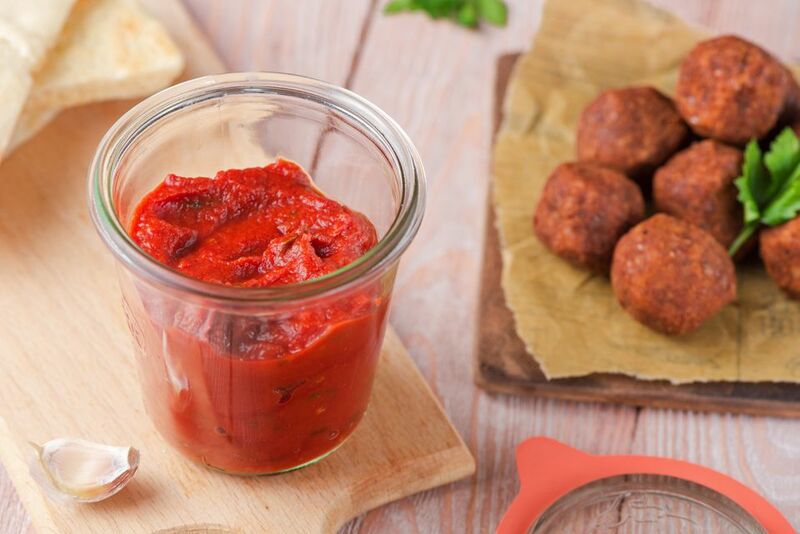 Serve falafel hot sauce immediately as a dip for falafel or drizzle onto falafel pita sandwich. One of the main ingredients in this hot sauce recipe is harissa, which is a hot chili paste that is commonly found in North African cooking, mainly Moroccan, Algerian, and Tunisian cuisine. It is added to couscous, soups, pastas, and other recipes. It can also be purchased in Middle Eastern stores in a can. For a very spicy harissa: use a blend of cayenne, chile de arbol, or cayenne with a milder chile like ancho chilies. For a medium spiciness: use a blend of New Mexico chilies with guajillo chilies. Falafel is very popular in the Middle East as a fast food. Vendors sell it on the street corners is most popular in countries like Israel, Egypt, and Syria. It is regarded as a "fast food" and sold like hot dogs by street vendors. Falafel is also the national dish of Israel.